U.S.-Mexico Border Crossing Grows More Dangerous Over the past decade, easier places to cross into the U.S. have been closed, so people are being pushed into isolated areas. Now, even though the number of illegal crossings has dropped substantially, the number of deaths remains a constant 200 a year. Border Patrol Search, Trauma, and Rescue teams are trained to help distressed migrants and border agents in the desert. 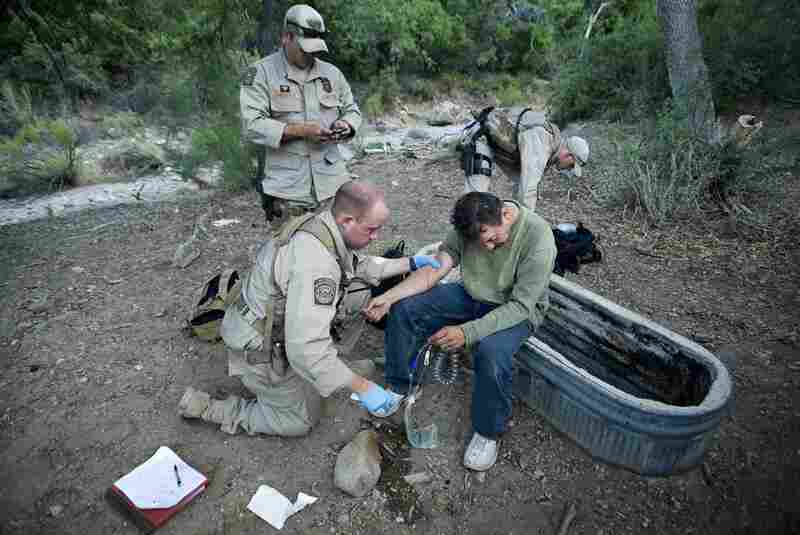 BORSTAR agent Jared Ashby (left) gives medical aid to Victor Manuel Lopez-Galindo near Red Canyon, Ariz., on June 11. Lopez-Galindo had been attacked and robbed by drug smugglers. He finally started a fire to signal for help after hiking five days in the desert with 1 gallon of water. 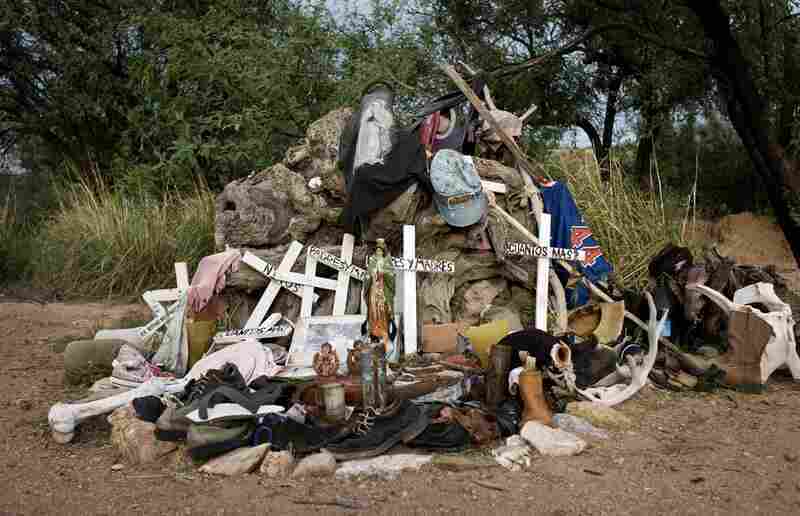 Despite an overall drop in the number of people crossing the border illegally, the number of deaths in the desert remains constant — averaging about 200 per year. 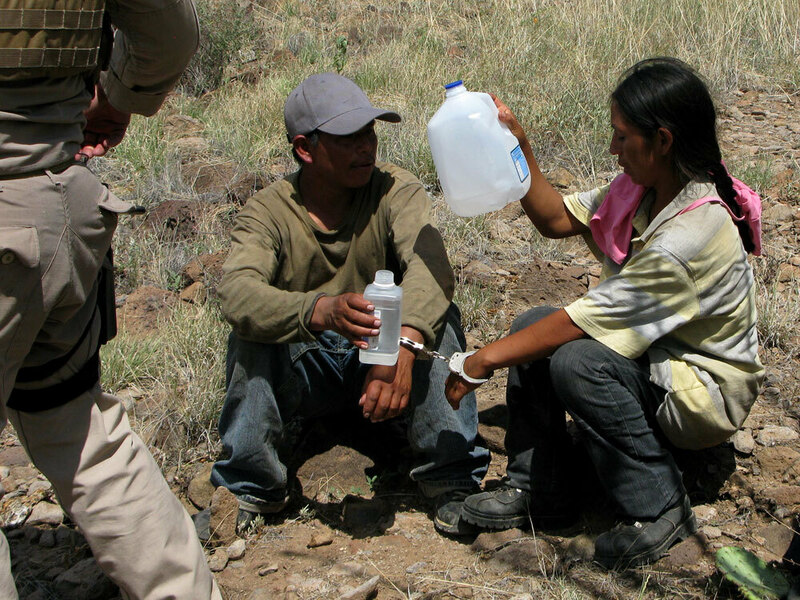 As easy border crossings become harder to find, more migrants are forced into the harsh environs of the Arizona desert. 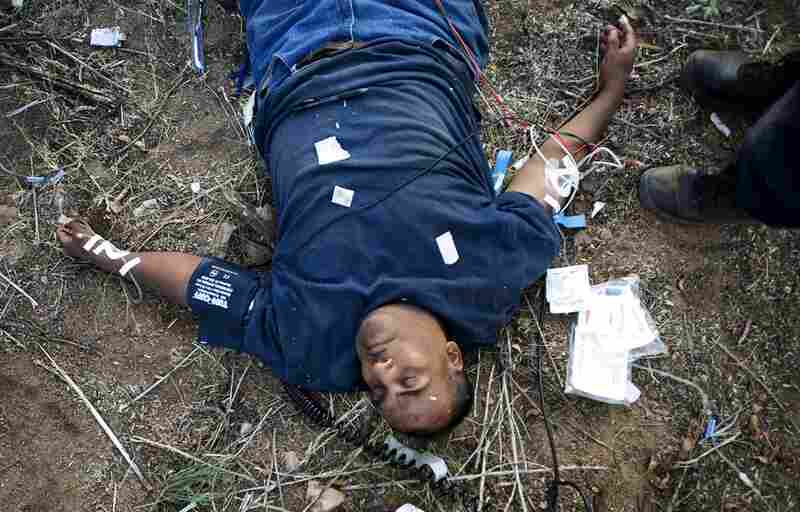 Acevedo Guadalupe-Herrera, 43, from Ahuacatitlan, Guerrero, Mexico, lies unconscious next to a ranch near Green Valley, Ariz., on Aug. 8, after walking for five days with no water. Guadalupe-Herrera was found by a ranch hand and presumed dead, although he recovered with the help of IV fluids. 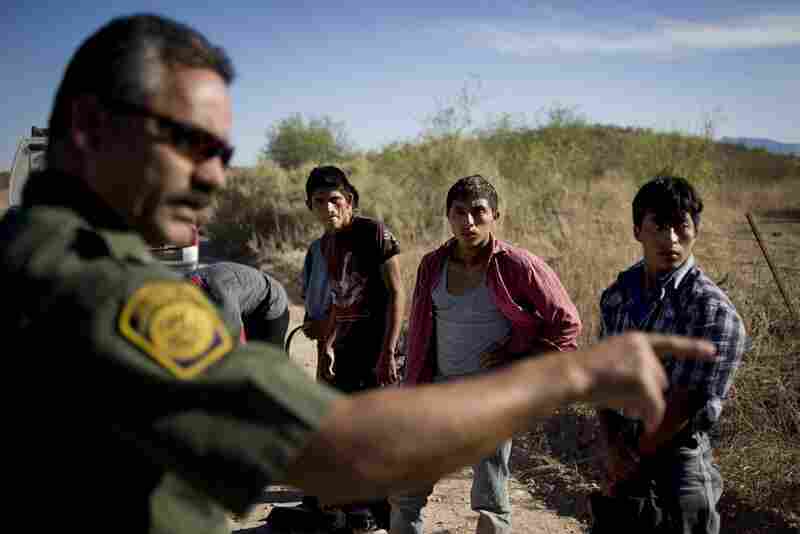 A Border Patrol agent lines up a group of immigrants caught while passing through the desert along highways 286 and 86 in Tucson, Ariz.., on June 10. When migrants are found by the Border Patrol they are returned to the border, where many will attempt the five-day hike to get into the United States several times. The pedestrian fence ends a few miles from the port of entry at Sasabe, Ariz. To the right are barriers designed to keep vehicles from crossing. 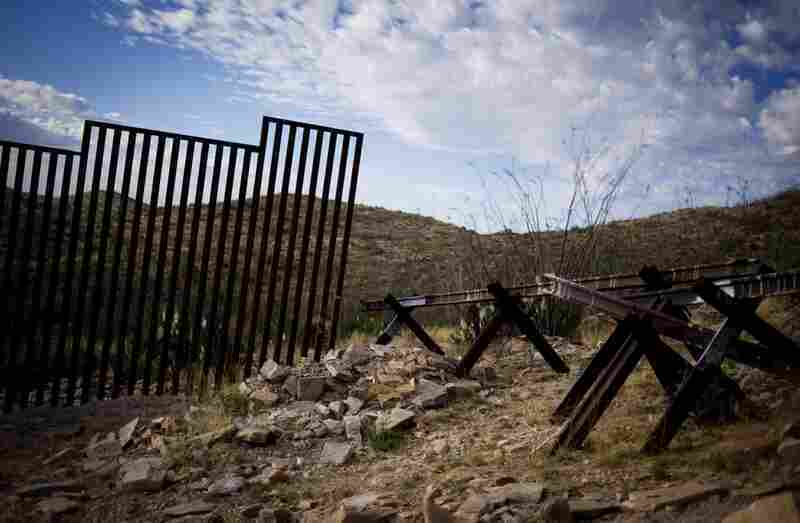 Nearly 700 miles of walls and barriers have been built along the U.S.-Mexican border. Desert and mountain ranges remain open and are now major crossing points for drug smugglers, human traffickers and migrants. A man is detained by the Border Patrol after being spotted by a citizen and reported to officials near Green Valley, Ariz., on Aug. 9. Rows of body bags containing remains of unidentified people found in the desert sit in a cooler outside the Pima County Medical Examiner's Office in Tucson on Aug. 12. 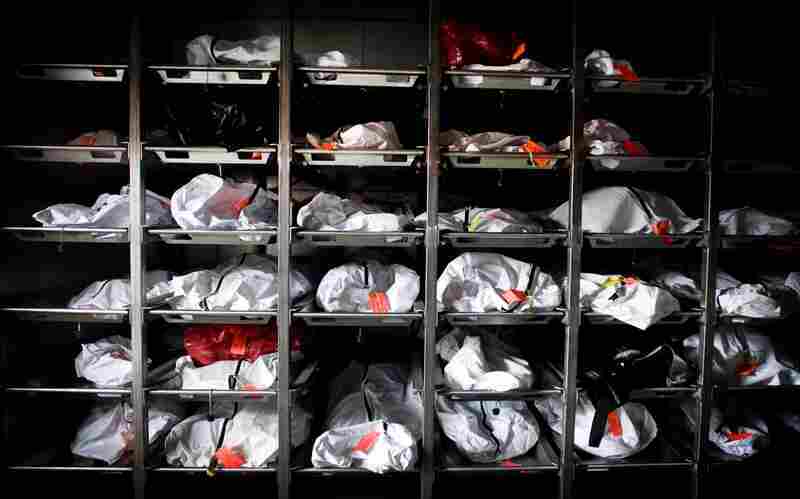 The identification process can take years for each body, resulting in an overflowing caseload for the medical examiner. 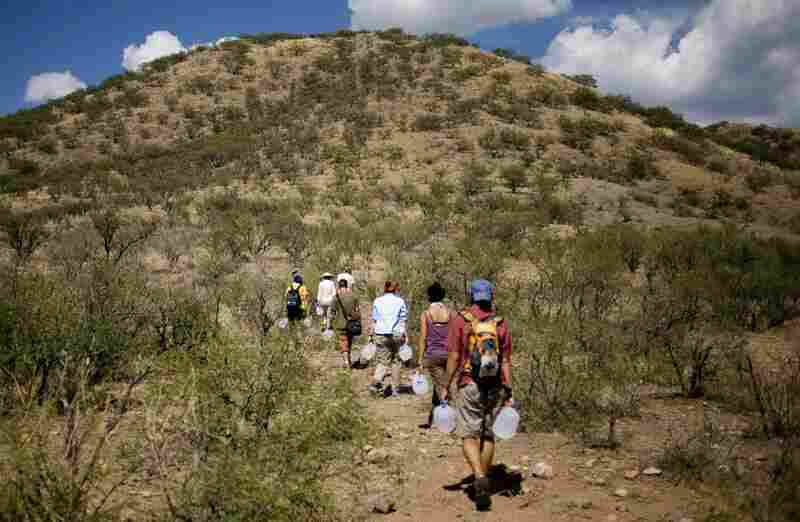 Volunteers from the humanitarian aid group No More Deaths carry jugs of water to a popular crossing path in Chiminea Canyon outside Arivaca, Ariz., on July 21. 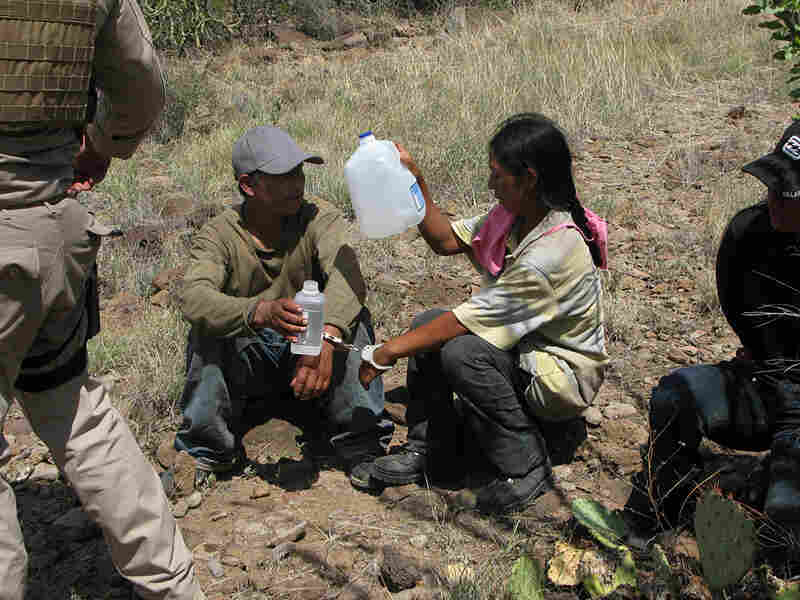 The group drops off water and gives medical attention to migrants trying to cross from Mexico through the desert to the United States. 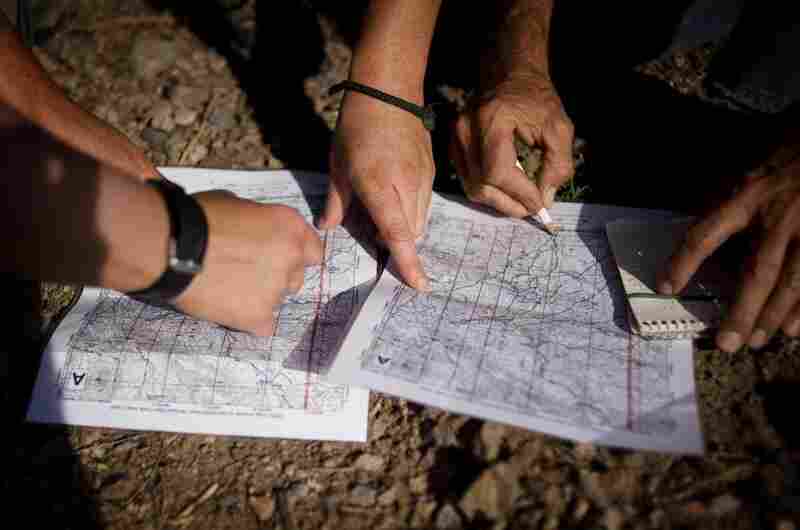 No More Deaths volunteers look at trail maps to decide where a water drop patrol will take place outside Arivaca, Ariz. Members of the group have spent years walking the trails in the Arivaca region to track migrant crossing patterns. The number of people apprehended illegally crossing the U.S.-Mexico border is down more than 25 percent, according to Customs and Border Patrol, but the rate of people dying while trying to cross is up. No one knows whether the decrease in crossers is due to the recession keeping people home, the thousands of new border patrol agents or the more than 600 miles of new border fence that has been built. But what is clear is that over the past decade, easier places to cross have been closed, so people are being pushed into isolated areas. U.S. Border Patrol Search, Trauma and Rescue teams perform hundreds of rescues each year. They also discover the bodies — or skeletons — of those who didn't make it. 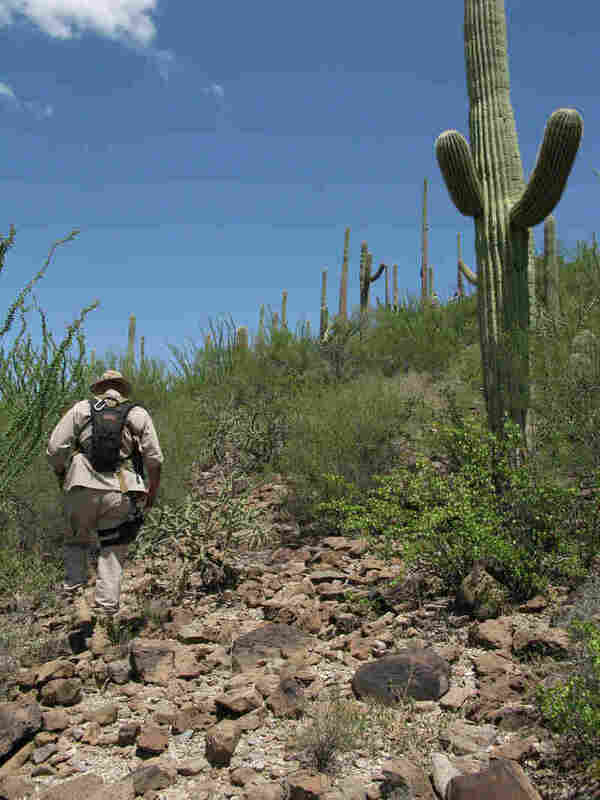 Border Patrol Search, Trauma and Rescue agent Paul Dubois is seen in the Sonoran Desert in southern Arizona, about 50 miles north of the Mexican border. One scorching afternoon last month, Paul Dubois, a Border Patrol Search Trauma and Rescue agent, and his team were trying to catch up with a group of a dozen illegal crossers about 50 miles north of the border. The terrain is remote and rugged, so a helicopter helped Dubois search for the group, and given the intense desert heat, delivered jugs of water to the team and to the crossers. When Dubois and his crew finally caught up to the group of crossers, all but three had escaped — including a girl the helicopter pilot said he had spotted. Two women and a man remained, sitting on the ground in custody. The man said his name was Elario. He said he was from Michoacan, Mexico, on his way to Florida for work. 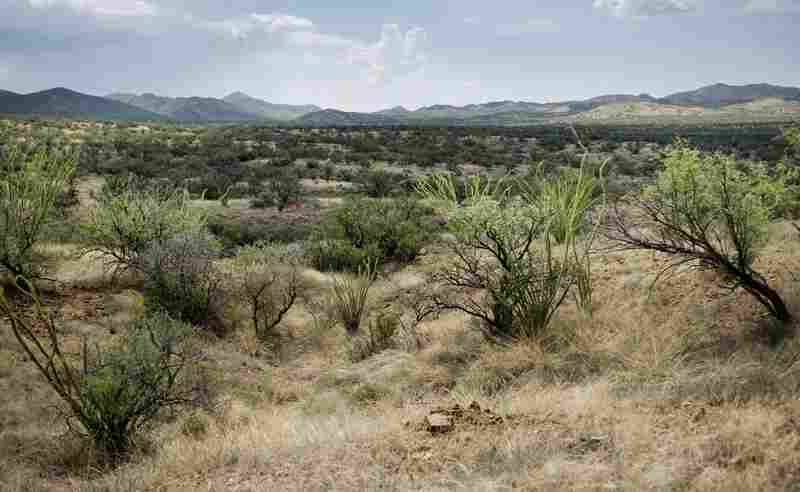 Led by a coyote — a human smuggler — they had been walking four days from la linea — "the line" or the border — in the desert. They were not injured but were dehydrated. Dubois says there's no way anyone can prepare for this. "I think you're dealing with individuals in most cases that are dealing with a dire situation at home. And they think this is the best situation," Dubois says. "And they may be blinded to the reality of what's in store for them. You can't carry enough water. You can't carry enough food supplies. You're gonna have medical complications perhaps." U.S. Border Patrol Search, Trauma and Rescue teams capture crossers who say they are from Michoacan, Mexico, and have been walking in the desert for four days. The Rev. Robin Hoover, founder of Humane Borders, a group trying to reduce the number of deaths at the border, does not think the U.S. border policies are effective. Hoover pulls out maps of Arizona that show bodies discovered at the border. He has noticed a trend. No matter how you measure it, Hoover says, bodies are being found farther and farther from roads. It's been a steady 200 bodies a year, despite the drop in illegal crossings. In other words, the rate of deaths is higher. It's become more dangerous to cross. David Hoffman, head of the Border Patrol's planning, policy and analysis division, doesn't dispute Hoover's numbers. But Hoffman blames the human smugglers for leading their customers into harm's way. "As we have taken away, denied areas where they traditionally worked in the past, they are going to some of these remote areas," Hoffman says. Hoffman says the Border Patrol will continue the strategy of pushing people into remote areas as long as Congress and presidents since Bill Clinton order the agency to. Hoover calls that Washington policy short-sighted. "We've already demonstrated in this corridor that if you double the number of agents and technology out here, it doesn't have an effect on the migrant deaths," Hoover says. "This is an immoral policy. It's a deadly policy. It lacks imagination, and it cannot be morally supported." As for the three captured crossers in the Arizona desert, they were escorted along a dry wash to a waiting SUV where they were taken to Tucson, Ariz., and processed through the system. Then they were most likely driven or flown back to Mexico — perhaps to try the deadly crossing again.